Womenade is a grassroots organization that provides financial assistance through one-time grants of up to $500. The purpose of the program is to help individuals who are normally self-sufficient and are experiencing temporary and/or unexpected financial hardships get back on their feet and move forward in their lives. 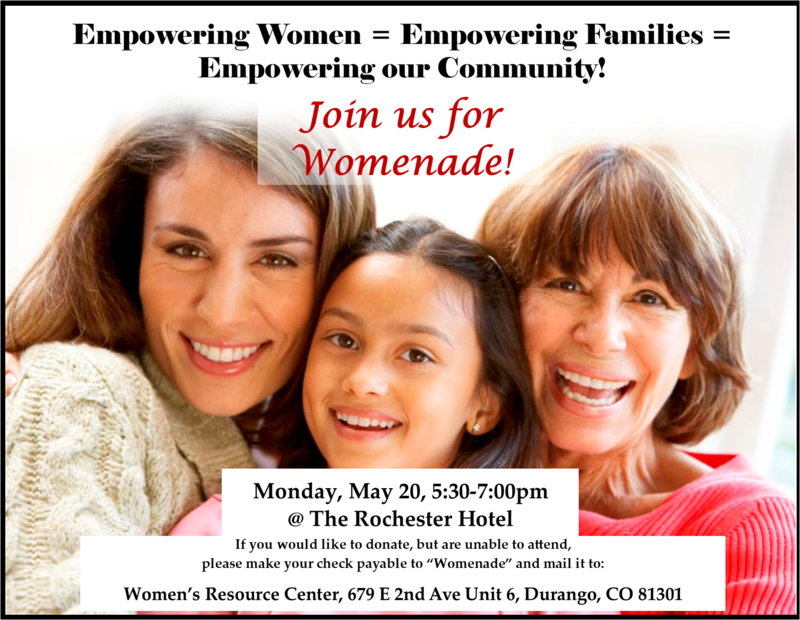 Womenade evenings are held from 5:30 to 7:00 pm at the Rochester Hotel. Bring a minimum $35 for the donation fund and a friend. Appetizers will be provided and a cash bar is available. Applications are anonymously presented and donors vote to determine the recipients of the money raised that evening. Womenade funds have been used to help with car repairs, dental work, child care, and other emergencies. For more information, contact the Women’s Resource Center at (970) 247-1242. What kind of needs can Womenade help with? **Womenade does not assist with rental or utility deposits of any kind. How do I apply for Womenade funds? To apply, come to the Women’s Resource Center to pick up an application (679 E. Second Ave., Suite 6, Durango, CO). Applications are taken every other month during the dates listed below. Applications are not accepted outside of those dates. Applying for Womenade does not guarantee that you will receive funding. Granted funds are available the Wednesday following the Womenade event. Can’t make it to the event, but want to donate? Imagine looking for employment, running out of money and not being able to purchase the insulin you need to survive…or not being able to work or pay your bills, because you’re focusing all of your energy on your child, whose kidney has faile…or needing your roof fixed, so you can provide shelter for your grandchildren, whose mother has just passed away. How would you feel? What would you do? Would you have the courage to ask for help? 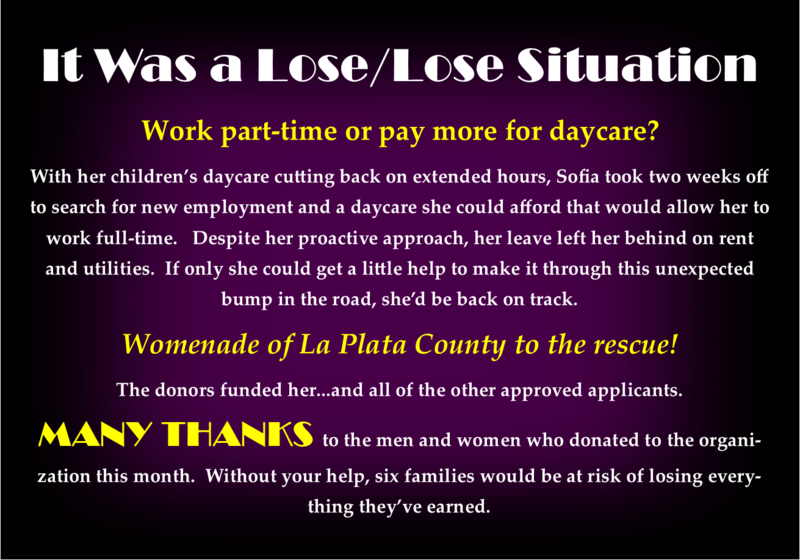 These women did, and Womenade of La Plata County answered. Those who attended the Womenade potluck responded with their hearts and wallets, and funded all eight of the qualifying candidates. When it was announced that all but one had been funded after the donations were originally counted, the wallets flew back open to accommodate the additional need. 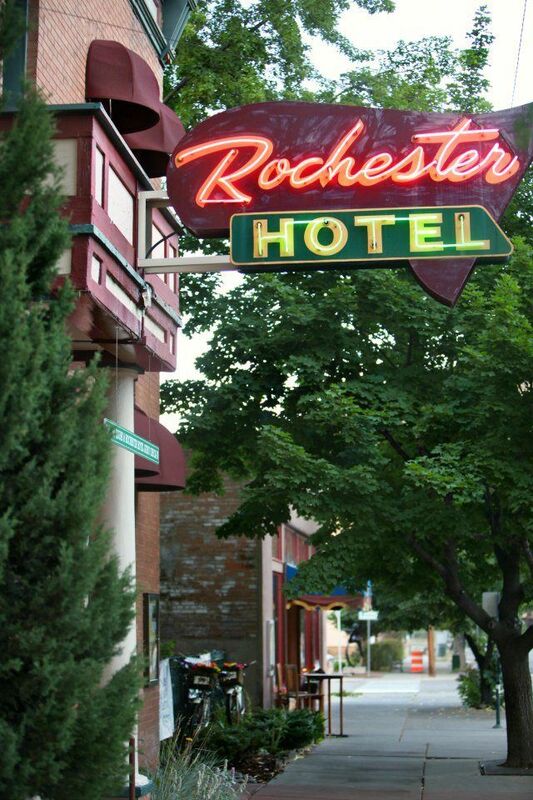 Many thanks to The Rochester Hotel for graciously supporting the event and to all of the donors who answered the call and made a difference in these women’s lives!